The site of the landward end of the "Harlech Tramway", a horse-drawn line which ran from about 1878 to 1886 towards the beach. The trackbed can be seen as a faint line heading left to right in this view. Apart from faint traces in regional newspapers of the period, scant evidence has been unearthed of the tramway, its purposes, opening, closing, gauge etc. The Harlech Tramway is not to be confused with the 2nd World War "Harlech Military Railway" which left the main line at a junction a short distance north of Harlech station. The water gate. Many years ago the land in front was swampy and a water channel came to this point allowing supply by sea. Railway line On the Cambrian Coast Railway with services North to Porthmadog, Criccieth and Pwllheli, and South to Barmouth, Machynlleth and Shrewsbury. The railway line was damaged by remedial bridge work (Pont Briwet) in November 2013 and suffered badly in the storms of Winter 2013-4. The line from the South to Harlech reopened April 2014, but did not reopen beyond Harlech until September 2014. Trains were stranded on the line and were taken off the line in Barmouth for transport by road. Harlech Castle Post code LL46 2YH Grade 1 listed building - Cadw Building ID: 25500 Also a scheduled monument. World Heritage List. An example of concentric castle design. 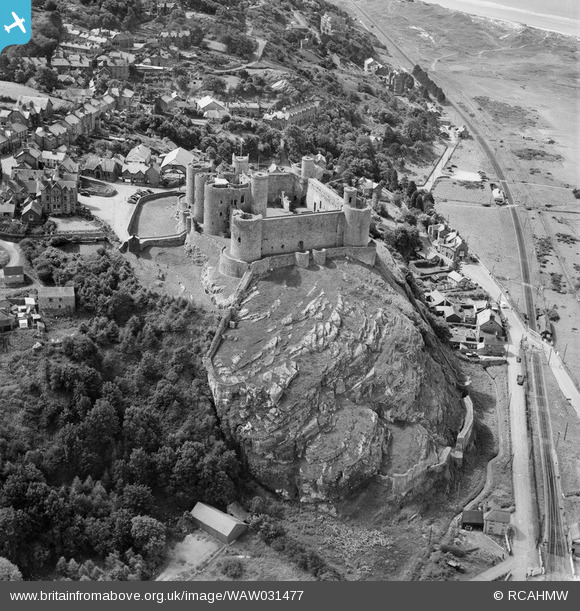 It was built by the English King Edward I following his conquest of Wales, mainly between 1283 and 1289 with additions of c1295 and 1323-4. Designed by Edward's chief military engineer, the Savoyard Master James of St. George In 1294 the English garrison withstood a siege by the Welsh under Madog In the Spring of 1404 Owain Glyndwr and his forces took the castle which, for the next five years became his court and capital During the Wars of the Roses the castle was held by the Welsh Lancastrians before surrendering to the besieging Yorkists (as immortalised in the song 'Men of Harlech'). In 1647 the Royalist garrison under Colonel William Owen surrendered to the Parliamentarians; it was the last mainland British castle to hold out for King Charles I.